Matthew Klingle, a fourth-generation Westerner, was born and raised in Salt Lake City, Utah. A historian of the United States, his research and teaching focus on the North American West, environmental history, urban history, social and cultural history, and the history of science, technology, and medicine. He has received fellowships and awards for his work from the Andrew W. Mellon Foundation, American Council of Learned Societies, National Endowment for the Humanities, Rachel Carson Center for Environment and Society, and other government and professional organizations. He is the author of Emerald City: An Environmental History of Seattle as well as numerous scholarly and general audience articles, secondary school teaching materials, book chapters and essays. He also held a national fellowship in 2002-04 from the Environmental Leadership Program, a national organization training emerging leaders from wide-ranging social and professional backgrounds to promote greater diversity in the environmental movement. 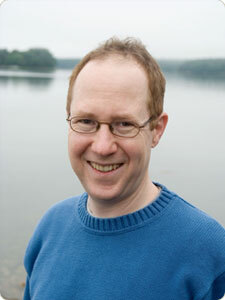 In 2006 he received the Sydney B. Karofsky Prize, Bowdoin's annual teaching prize for junior faculty. His current book project, Sweet Blood: Diabetes and the Nature of Modern Health, under contract with Yale University Press, explores how today’s health crisis grows from our changing relationships with nature and shifting patterns of social inequality in the United States and the world from the late-nineteenth century to the present day. My first book, Emerald City: An Environmental History of Seattle, surveys almost two hundred years of human and natural history in one of North America’s most beautiful cities. Combining environmental history, urban history, and human geography, Emerald City shows how attempts to reshape nature in and around Seattle have often ended not only in ecological disaster but also social inequality. The price of Seattle’s centuries of growth and progress has been paid by its wildlife, including the famous Pacific salmon, and its poorest residents. In this book, I propose a new way of understanding the interdependence between nature and culture, arguing for an “ethic of place.” Using Seattle as a compelling case study, Emerald City offers important insights for every city seeking to live in harmony with its natural landscape. My current book project, Sweet Blood: Diabetes and the Nature of Modern Health, under contract with Yale University Press, combines incisive research and engaging storytelling to explain how today’s crisis grows from our changing relationship with nature. It asks questions at the heart of the humanities: Who or what is to blame for the diabetes outbreak: human behavior, genetics and evolution, or an altered environment? Why has diabetes afflicted Americans unevenly, and should society address these inequities? And what connections between human nature and physical nature might promote and sustain health? The project illuminates these questions by examining the environmental, cultural, political, and scientific history of diabetes in the United States and the world from the Gilded Age to the present day. In the process, Sweet Blood argues for an expanded idea of what counts as the environment, an important contribution to address the diabetes epidemic. The project combines archival research with oral history and new training in the biomedical sciences and public health thanks to a New Directions Fellowship from the Andrew W. Mellon Foundation and a Public Scholar Award from the National Endowment for the Humanities. Given the staggering complexity of diabetes, an historical study of its etiology and ecology can pose vital questions about medical research, disease prevention and treatment, public policy, and the shifting meanings of health and nature in America. Ultimately, I hope to help tell stories that explore the origins of the diabetes epidemic that may shed light on possible ways to address it today and into the future. First, contact me by email, phone, or in person as soon as possible. Tell me exactly about the purpose of your letter. You can find my contact information on my official Bowdoin College web page. Second, give me least two (2) weeks (preferably a month) in advance of any deadline so I can write a strong letter. Please note that I write letters ONLY for graduate or professional school applications, academic awards and fellowships, study away programs, pre-professional or academic internships, and post-graduate jobs. In general, I do NOT write letters for general summer jobs, camp counselor positions, etc. although I am happy to serve as a reference provided that you check with me first. Third, tell me the purpose of your letter (internship, scholarship, graduate school, job application, study away, etc. ), your goals or motivations, and what you want from me as a recommender. Fourth, include a short résumé or curriculum vitæ detailing your academic and extra-curricular activities, work experience, study abroad courses, etc. so I can add these details, if relevant, to my letter. Fifth, include any forms (filled out in advance, please) and other material that you think might be helpful (personal statement, unofficial transcript, statement of purpose) to me before I write your letter. Also, please give me a self-addressed stamped envelope if I need to send the recommendation for you. One important suggestion: if you have the option to waive access to your letter, you should do so. Confidential letters carry more weight, and I will not agree to write a letter for any student that I cannot support. Sixth, you should consider if you also need a general letter of recommendation. If you need to establish a credential file, contact the Bowdoin Career Planning Center for help. Realize that general letters come with certain advantages (you can use them indefinitely, or if I'm unavailable to write you another letter) and disadvantages (personalized letters can be more convincing), so plan accordingly. Finally, if you need future letters, give me enough advance warning so I can tailor the copy I already have on hand for your needs. Attending graduate school in any field is an exciting yet daunting decision, regardless of what degree you pursue. It is not a choice to be made lightly. Unlike college, graduate school is a full-time job; you are training to enter a competitive, specialized profession. It is no different in this sense than attending law, business, or medical school. If you are considering graduate school, especially in an academic field for a terminal degree, such as a Ph.D., I urge you to read any one of the guidebooks listed below. I've found the Peters book to be especially useful, even if it is dated. For life after your terminal academic degree, the Kelsky book is invaluable as is her website, The Professor is In. You should also visit various websites for professional societies and academic organizations related to your intended field of study. Robert L. Peters, Getting What You Came For: The Smart Student's Guide to Earning a Master's or a Ph.D (New York: Noonday Press, 1997). Karen Kelsky, The Professor Is In: The Essential Guide To Turning Your Ph.D. Into a Job (New York: Three Rivers Press, 2015). Melanie S. Gustafson, Becoming a Historian: A Survival Manual--2003 Edition (Washington, D.C.: American Historical Association, 2003). Environmental Careers Organization, The Complete Guide to Environmental Careers in the 21st Century (Washington, D.C.: Island Press, 1998). Julie Degalan, Great Jobs for Environmental Studies Majors (New York: McGraw-Hill, 2002). Richard and Margot Jerrard, The Grad School Handbook: An Insider's Guide to Getting in and Succeeding (New York: Penguin, 1998). Dale F. Bloom, Jonathan D. Karp, and Nicholas Cohen, The Ph.D. Process: A Student's Guide to Graduate School in the Sciences (New York: Oxford University Press, 1998). Scott M. Deitsch, Green-Collar Jobs: Environmental Careers for the 21st Century (New York: Praeger, 2010). Jim Cassio and Alice Rush, Green Careers: Choosing Work for a Sustainable Future (Vancouver, Canada: New Society Publishers, 2009). An honors thesis is an opportunity for Bowdoin students to undertake advanced independent research on a topic of their choosing during their senior year while working closely with a faculty advisor. My colleagues in History and Environmental Studies advise honors theses in a variety of fields. Below is a list of the honors projects that I've supervised, along with the names of my colleagues who served on each reading committee. If you are interested in undertaking an honors project in either History or Environmental Studies, be sure to contact your prospective faculty advisor well in advance of the fall semester of your senior year. Look on the departmental webpages for specific honors requirements and deadlines. Davis, Ryan Ann Moloney. "No Common Ground: Management, Politics, and Compromise in the Gulf of Maine — A Documentary Video" (Honors thesis, Environmental Studies Program, 2004). Hon, Jimei Louise. "Becoming Cosmopolitan: Women, Alcohol, and Class Politics in New York City, 1880-1930 (Honors thesis, Department of History, 2009). Lipinoga, Sarah Beth. "Managing Oil and Nature in Eden: Transculturation and Resistance among the Huaorani of Eastern Ecuador" (Honors thesis, Environmental Studies Program, 2003). ** Published as Wallace Scot McFarlane, “Defining a Nuisance: Pollution, Science, and Environmental Politics on Maine’s Androscoggin River,” Environmental History 17, no. 2 (April 2012): 307-335. For more about Scot's journey from honors project to peer-reviewed publication, read this article from the Bowdoin Daily Sun, "Honors Thesis by Scot McFarlane '09 Published in Top Academic Journal," posted March 30, 2012; and this blog post by Scott on the Oxford University Press website in honor of 2012 Earth Day, "Cool, Clear Waters? On Cleaning Up US Rivers," posted April 20, 2012. McKay, Luke Joseph. “‘No Man’s Garden’: The Changing Nature of the Wilderness Idea in Maine” (Honors thesis, Environmental Studies Program, 2007). Thomson, Matthew William. "'A Personal Share in This Great Contest': The Civil War and Maine’s Fessenden Family" (Honors thesis, Department of History, 2006).